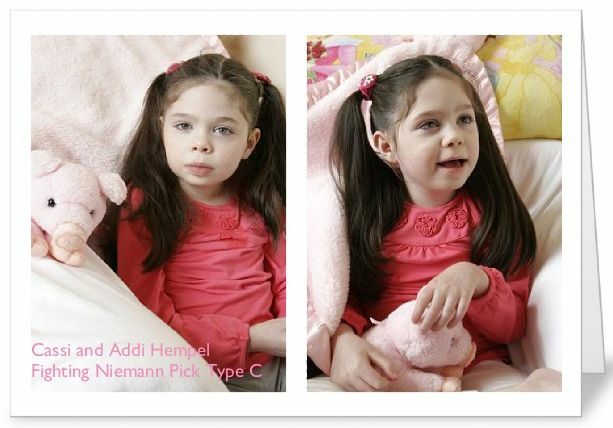 Over the past three years, many Niemann Pick Type C families as well as physicians treating NPC patients worldwide have contacted Dr. Caroline Hastings and I regarding Addi and Cassi’s treatments with hydroxypropyl-beta-cyclodextrin. Since sharing our intravenous (IV) and intrathecal (IT) cyclodextrin treatment protocols with NPC families and doctors in the U.S. and other countries, many NPC patients have started cyclodextrin therapy. Currently, I know of 11 NPC patients in various countries receiving cyclodextrin treatments – six are receiving intrathecal (IT) treatments to allow cyclodextrin to reach the brain. With many Niemann Pick Type C families scattered around the world, it’s difficult for people to obtain information on cyclodextrin and determine how they might be able to get started with treatments. In the past month alone, I have been contacted by families located in Italy, Spain, Germany, Dubai and Japan and all are interested in cyclodextrin treatments. I am writing this blog in the hopes it can help NPC families in other countries who are seeking information on cyclodextrin and help them understand how they may be able to treat their loved ones with this potentially life saving sugar compound. In the United States, the National Institutes of Health (NIH) has announced an intracerebroventricular (ICV) clinical trial with cyclodextrin. Dr. Forbes “Denny” Porter is running the clinical trial with an NIH Bench-to-Bedside Grant and with the help of the NIHs Therapeutics for Rare and Neglected Diseases (TRND) program and the National Center for Advancing Translational Sciences (NCATS). Details are limited on what the inclusion/exclusion criteria will be for the NIH cyclodextrin clinical trial and they are still preparing their IND for the FDA and conducting pre-clinical studies. The exciting news for NPC families is that the NIH has announced that they will pursue delivering cyclodextrin directly into the brains of patients using an Ommaya reservoir. An Ommaya reservoir is an intraventricular catheter system – a catheter is implanted into the brain and it is attached to a reservoir implanted under the scalp. Dosing is still being determined by work done on NPC animal models, including the naturally occurring NPC cat model. I am sure dosing will be quite similar to what we are already giving to Addi and Cassi (possibly every two week cycle) as the FDA likes to base clinical trials from animal data. The NPC cats receive bi-monthly doses of cyclodextrin and Dr. Hastings based our initial bi-monthly IT treatment plan from the same cat studies. In my previous posts, I have detailed our plans with trying to get cyclodextrin into the twins’ brains. In October 2010, Dr. Hastings received FDA approval to start the twins on intrathecal injections of cyclodextrin into their spines. Since Addi and Cassi were the first in the world to ever receive this treatment, safety was a primary concern. We initially started with intrathecal injections into the spine because we had to prove that the twins would not have an adverse reaction or die from an injection of cyclodextrin into their central nervous systems. Also, intrathecal treatment was less invasive. Per our FDA approved protocol, the twins must be hospitalized and monitored after intrathecal treatments. At first, they were monitored for 24 hours. Currently, we’re down to three hour observations following IT treatments. Since October 2010, Addi and Cassi have received over 20 intrathecal injections of cyclodextrin into their spines as we work towards a permanent solution. The twins were going deaf before we initiated intrathecal cyclodextrin therapy. We have now restored their hearing to normal levels which is quite encouraging. We also continue with our weekly IV infusions of cyclodextrin into their bloodstreams and are also looking for ways to deliver cyclodextrin into the lung as IV and IT treatments do not appear to reach the lung. Over the past year, we have been creating an intrathecal protocol with the help of Medtronic and Johnson & Johnson and plan to implement a Medtronic SynchroMed pump system to deliver cyclodextrin into the brains of the twins. Medtronic is currently conducting final pump studies with cyclodextrin and we hope to re- submit data to the FDA and our hospital Institutional Review Board (IRB) in September. We are working towards a SynchroMed pump solution because the NPC mice data shows that low continuous dosing is effective in completely stopping NPC. NPC mice are now being treated like diabetics. Cyclodextrin may need to be given on a frequent basis (perhaps daily or even weekly). We simply don’t know. We will start with a weekly bolus of cyclodextrin through the pump. The Ommaya port does have many advantages, however, it does not offer frequency of dosing — it’s an access port versus an automatic system. In addition, it is my understanding that the Ommaya requires a patient to be in a hospital setting to receive a treatment (in the United States). SynchroMed pump refills can be made in an outpatient setting once the pump is installed and the pump lasts about seven years. The beauty of the Ommaya system is that you know for certain that cyclodextrin is reaching the brain. I believe the NIHs plan to pursue the Ommaya option is the right decision for the clinical trial and to determine efficacy. I hope many NPC patients will be eligible to participate in the clinical because I believe cyclodextrin could be life saving. Since Addi and Cassi have been receiving cyclodextrin treatments for almost three years, they will not be eligible for the NIH trial. Many other NPC patients, especially those in foreign countries, will also not be able to participate in a U.S. clinical trial and therefore may want to pursue treatments in their individual countries. Hugh and I continue to look at a longer term and permanent solution for cyclodextrin treatments as it appears cyclodextrin will be a life-long treatment. We are looking for a solution that provides flexibility on dosing and also keeps our kids out of a hospital setting as much as possible. Medtronic’s data shows high catheter placement into the spine will allow cyclodextrin to reach brain and we will be taking this chance. We know that our intrathecal treatments in the lower spinal area are reaching the twins’ brains as we have restored the twins’ hearing to normal levels. But there are still lots of unknowns and many risks too. There is no easy decision and no right answer. Also, I am not sure if an infant can get a SynchroMed pump placed so the only option may be an Ommaya. The NPC animal data shows that the sooner the animals start cyclodextrin treatment (BEFORE symptoms are evident) the healthier the animals stay. The good news for NPC patients and families worldwide is there are now promising treatment options to pursue which were not available before. Doctors can look at both Ommaya or SynchroMed solutions to get cyclodextrin into the brain and consider these options today for their patients. I believe we’re ultimately going to need combination therapy to treat NPC as the disease impacts every cell in the body. We’ll need ICV or IT to reach the brain, IV to reach the organs and tissues and probably some type of inhalable HPBCD to reach the lung. These are the options we are pursuing to try and save Addi and Cassi’s lives. We hope this information will help other families as they look for any possible way to save their loved ones from this wretched disease. It’s nice to know that medical advances nowadays are fast improving and treatments for diseases like NPC will soon be available in drugstores all over the globe. May we hope that someday all ailments can be cured completely. It’s great that this clinical trial will start in america!! In the Netherlands it will take a while before the doctors are ready. I have discussed this option with our docter, but he says that Julius is still doing so good and the risks of this treatment can be high. So i don’t know what to do. For now I have also put my hope on the panobinostat. Do you notice other differences in Addi and Cassi since the cyclodextrin infusions? What I can tell you is that in the NPC animals (mice and cats) when they start the cyclodextrin at birth before any symptoms start, they are completley stopping the progressive neurological condition. They are treating the animals like diabetics. I am quite sure that had I not started cyclodextrin therapy on the twins, they would not be alive today. I am not counting on panobinostat — apparently, it only will work on certain mutation where there might be levels to boost? This will likely not help my twins. Thank you!! We are just starting to determine a treatment process now for a 4.5 y.o. recently diagnosed. This may be our starting point! Not sure where you are located — not many alternatives for us and this seems to be our best chance/hope for our kids.